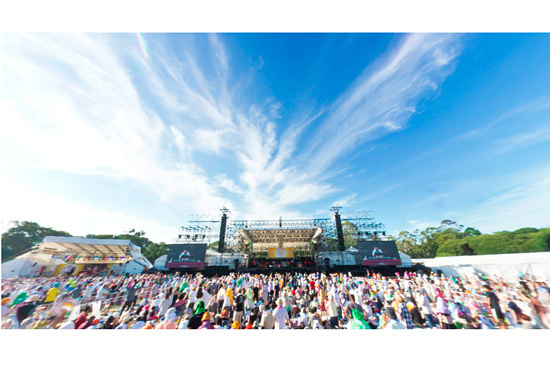 Yesterday, Hikashu performed a short set at World Happiness, the day-time outdoor event held at Yumenoshima Koen, a huge park located in east Tokyo. We cannot say it was an ideal setting for the group. Actually, there were some difficuties. But it turned out to be great eventually. So what are that difficulties? Well, there were some. First of all, the characteristics of the event. Judging from the line-up, it was clearly aimed for the people who used to be hipsters in mid 1970s to late 1980s. And Hikashu has never been "fashionable," maybe except for the first few years. Hikashu was an apparently heterogeneous among the line-up. There were the artists of various styles appearing the festival. And they were not mere passing acts. In short, they were all acts for connoisseurs. But they were, basically, conventional pop and rock as well. And Hikashu cannot be described as such in any way. So is the audience's tastes. Whether the people who gathered at World Happiness accept or refuse the band? Only time would tell you that. Hikashu's set started at 14:55. In the beginning, they set about improvising, as always, but it was unusually short. Just for the moments. And immediately Shimizu's piano started playing the opening phrase of "Fude wo Fure, Kanta-Kun" [Wave the Brush, Mr. Beyond]. Then the entire band quickly took that, and rushed swiftly into the tune. Unfortunately, the time was quite limited, so they had to make some hard decisions for maximizing the opportunity. It was a difficult problem indeed - representing the 35-years old band for just half an hour. The result was interesting. They just concentrated representing the band in the present tense. That is, they played only the numbers from the 21st century. Most of the other acts were mainly playing old tunes and that's proper decision for the event. But Hikashu had no need or urge to do that. They are actual. They live in the present, not the past. And their performance proved that clearly. Also, they had to refrain from collective improvisation, which is one of the characterizations of the band. But the time was precious and some things to be sacrificed. There was an exception. The last number was "Pike." And it was an appropriate selection as well, because it was a fine example of "new wine into old bottles." In the band's repertoire, Pike is one of the most known numbers. And it was apt for showing the attractiveness of the current line-up. After all, the band's performance was great as usual and the intention, which was to represent the band properly, was fulfulled. The audience's reaction was mixed. For certain, some people disdained. During the opening number, some just fled and retracted into the restrooms. It's sorry but understandable. For the people who think that Hikashu is synonymized with a horrendous word called techno-pop, their current style is simply out of place. For them, Hikashu was only an unwelcoming intruder who marred the precious moments of nostalgic trip. But there were some who apparently fascinated by the performance who cheered eagerly the band. We've already said that World Happiness is for connoisseurs and it's natural that some of its audience were eclectic enough, in good sense, to accept the current style of Hikashu. And we'd like to mention that many musicians came out to check out the band's performance as well. After the 25 minutes of intensity, Hikashu left the stage. The audience, who were still there, went wild and seemed to be impressed. In twitter, there were mentions that a lot of people got exposured for the band for the first time and quite impressed. Also many people cited Hikashu as the best act of this year. 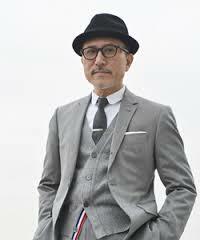 World Happiness is an annual event initiated by Takahashi Yukihiro, who is the drummer of the world-famous Yellow Magic Orchestra. And it seems that Takahashi is the man who decided to appoint Hikashu. In fact, during their set, Makigami told the audience that their long-time friendship made the appearance and thanked him for that. Hopefully Takahashi and his company will make a wise decision again to book the band for such a beautiful event.